Rice noodle wrap with fresh ingredients roll and served with Beyond's peanut sauce. Choice of Chicken or Shrimp or Tofu. Deep fried spring rolls stuffed with marinated glass noodles. Choice of Chicken or Vegetables. Served with sweet & sour sauces. De-boned chicken wings stuffed with mixed of ground chicken and glass noodles. Fresh calamari fried light and crispy. Served with sweet & spicy sauce. Skewered and grilled with coconut milk, choice of marinated tender Beef or white meat Chicken. 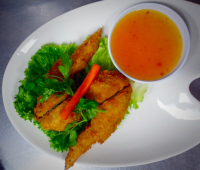 Served with Thai pickled cucumber and peanut sauce. Crispy rice noodles with shrimp and tofu. 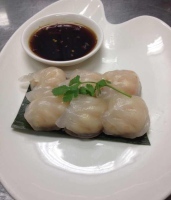 Steamed shrimp dumplings served with chef's dipping sauce. 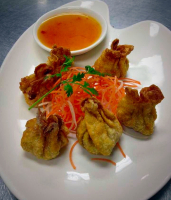 Golden fried wonton stuffed with ground marinated chicken. Served with sweet & sour sauce. Marinated shrimp wrapped with crispy wonton skin. Served with house sweet & sour sauce. Variety of Beyond's Appetizers: Chicken and Beef Satay, Chicken Spring Rolls, Shrimp Summer Rolls and Thai Golden Bags. 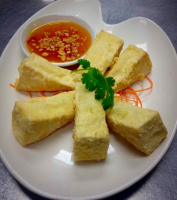 Fried tofu served with sweet dipping sauce. Golden fried wonton stuffed with cream cheese and avocado.